ExpressVPN are best suited for those looking for a big range of server locations, protecting their Wi-Fi usage and accessing geo-restricted content. Easy to use software and apps. Large range of server locations. Monthly price more expensive than others. Read our latest, updated ExpressVPN Review 2016 by clicking this link. ExpressVPN is one of the bigger VPN providers but not always mentioned in comparison to some of the more well-known names. Considering their absolutely huge range of server locations one would think they would be mentioned slightly more in the VPN world. I spent the week putting ExpressVPN through its paces. In this review I’ll find out what is good, bad and indifferent with their service and in this ever growing marketplace finding out if they as one of the larger providers are doing what they can to keep up with the big boys. ExpressVPN has a similar set up to the majority of VPN providers and offer one standard package that varies only in the length of time you wish to subscribe for. So no matter what you pay you receive their full service regardless of how long you sign-up for. For a newcomer this is great news because you’ll have no confusion over any differences in packages. As is standard across the board for VPN service providers who offer the 1 plan type service the costs of the service are greatly reduced by taking longer service lengths. 1-Month costs US$12.95 per month. 6-Months costs US$59.95 equivalent to US$9.99 per month. 12-Months costs US$78.66 equivalent to US$6.55 per month. The individual price for one month is slightly higher than the majority of providers and so considering a longer service length is really beneficial. US$6.55 per month on the yearly account is a steal of a price and competitive with most other providers. ExpressVPN offer a huge 30 day money back guarantee that is pretty much unheard of from other VPN providers and allows you to test the service for a range of purposes over quite a long period of time before deciding whether it is good enough for your use or not. ExpressVPN target their service to a wide range of customers from the beginner to the expert and with solutions for both their service is well equipped no matter what type of customer you are or what you intend to use the VPN service for. The major range of VPN protocols are available with ExpressVPN offering PPTP, L2TP/IPSec, OpenVPN and even SSTP. For those interested in using SSTP, ExpressVPN may be a good solution as this protocol is not offered by every VPN provider. A full suite of software is available for Windows, Mac, Android and iOS (iPhone / iPad) that means you can use the service across all the most popular devices. Custom software allows users to make a quick connection without any manual set-up. For those who want to make a direct connection via OpenVPN or the other protocols, set-up configuration files and guides are available. Set-up guides are available for a wide range of VPN routers, Linux, Chromebook, Amazon Kindle and a host of other devices. I opted to use both the Windows and Android custom software. The Windows software is extremely minimal allowing connection from one main window with the settings area tucked away elsewhere. Connection is actually rather simple, select a country to connect to and then press connect, the software then takes care of everything else and you’re free to get on browsing securely. Windows custom software is one of the easier we’ve seen. All four VPN protocols are available via the custom software which is an added advantage as not all providers allow connection using their range of protocols via their custom software. The custom software allows you to use DNS servers suggested by ExpressVPN that will stop DNS leaks and make your browsing usage even more private. Sadly there is no kill switch or ability to stop programs should the connection drop and it’s something I’d like to see in a future version of their software. The Android app is similar to the desktop software and is minimal in design. A list of countries available to connect to make up the main screen with the ability to “ping test” them to find the fastest. Settings are available in a separate menu that allow you to choose between UDP and TCP which is unusual for an Android app and a nice touch being given the option. The Android app is quite simple to use. I wasn’t able to test either the Mac or iOS options as I don’t own either device but from screenshots they look basically the same as the Windows and Android ones so will be equally easy to use for both the beginner and expert alike. ExpressVPN is in a tiny league of VPN providers that offer a massive wealth of server locations. In fact, I can only think of one other provider off the top of my head with more country locations available. At the time of writing there are connection points in over 78 countries. Nearly every corner of the globe is covered including the Americas, Asia-Pacific, Europe and the Middle East & Africa. Offering such a large span of countries makes the service of ExpressVPN suitable for most users around the world and for those of you who travel extensively either for business or pleasure you’ll be hard pressed to find a country unavailable and if so most neighbouring countries will have an available server. The service offers unlimited bandwidth, unlimited switching between servers across their full range of 78+ countries and unlimited speed depending on your own internet connection. The service can be used on 2 devices concurrently specified as one desktop and one mobile device. ExpressVPN works slightly different to the majority of VPN providers in that they do not supply a username or password for use on their software or when connecting to their servers directly. For their software they use a license code system that is supplied to you after following a link in your welcome email. If you choose to make a connection directly with the OpenVPN GUI then server config files and certificates are available online under the Linux & Routers section and can be used for all systems that support OpenVPN. One area that isn’t often mentioned is the installer and the installer of the Windows software is actually extremely good. Custom software often requires additional programs or drivers to be installed such as the Tap driver. I have witnessed many occasions where installers have basically messed up the installation of the Tap driver and so lengthy uninstalling, reinstalling and general tinkering was required to fix. The ExpressVPN installer suffers no such fate and does various checks to see if .net framework or the tap driver are already installed and if not handles this in the correct manner. While it may not seem worthwhile mentioning you would be surprised the countless headaches I have been left with attempting to install some other VPN providers software making the installer for ExpressVPN a breeze. 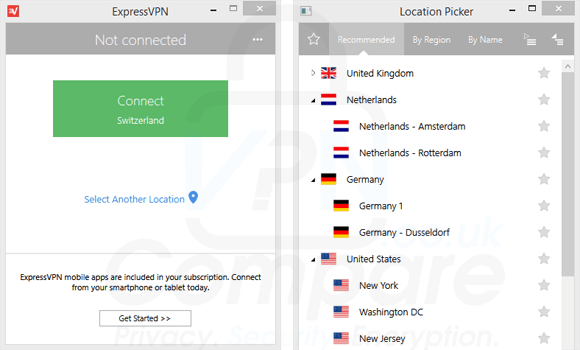 Putting ExpressVPN through its paces was an easy task. As part of my work using the internet is part and parcel of it and so heavy internet use is something I do regularly. To test ExpressVPN I used their service for a little over a week for my everyday browsing. I’m pleased to report that I suffered no issues doing the things most of us do on a daily basis, in fact as someone who works online I probably used it more intensively than most. Thumbs up for browsing, TV streaming, video streaming and host of other “normal” internet activities. No noticeable slowdowns or issues when carrying out general tasks. Using streaming services such as BBC iPlayer, Sky Go and the range of other UK catch-up and live TV services worked without buffering even in peak times. Hulu in the US also worked without speed issues. One or two ExpressVPN servers are blocked from accessing Hulu but connecting to others worked fine and even allowed me to stream in “High” quality from the US to the UK. Our standard test procedure involves downloading a 10GB test file from a popular web hosting company. We make use of a download manager to open concurrent connections to the file to give the best possible speed. 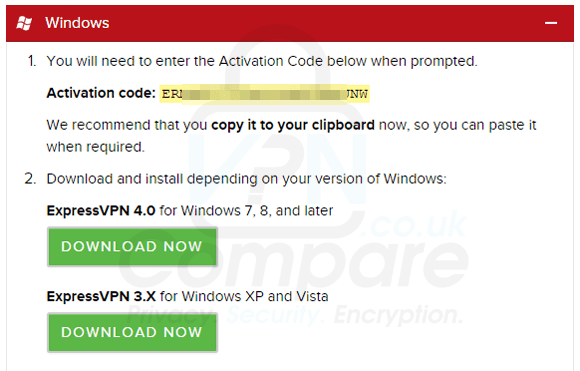 All tests were carried out from the United Kingdom using custom software from ExpressVPN on a Windows 8.1 system. Our download speed achieved without using a VPN at the time of testing was 88 mbps. The servers tested in order were Canada, New York – US, Germany, Netherlands, Switzerland & United Kingdom. Speeds achieved would be suitable for streaming up to 4k video from all servers however for intensive everyday use ExpressVPN fell short in the speed department. Those who download regularly will usually aim to achieve much higher speeds and so if you download big files on a regular basis they may not be suitable for your usage. While the UK server was slower than some competitors the servers at a further distance such as New York, US, and Canada achieved better results. So overall not the fastest provider but more than suitable for everyday use. I would like to see ExpressVPN improve on their server speed especially for servers geographically closer such as the United Kingdom for myself. ExpressVPN offers 4 different protocols that include SSTP. The other three being PPTP, L2TP/IPSec & OpenVPN. After contacting ExpressVPN to clarify I was informed that that L2TP/IPSec and SSTP use 256-bit encryption. OpenVPN is stated as using 256-bit encryption and while true for the control channel (authentication) the actual data channel (what passes through the VPN) uses 128-bit encryption. By default, ExpressVPN uses the BF-CBC cipher. A 1024 bit RSA key is in use which although claimed to be secure enough in some sectors it is something I would like ExpressVPN to urgently upgrade which is something they tell me is coming in the near future. The Terms of Service and Policies for ExpressVPN are clearly available at the bottom of the site and all bundled into the one document. Apart from the usual agreement not to use the service for illegal activity ExpressVPN state they do not log traffic data or browsing activity. Like most providers ExpressVPN retain billing information but not to be shared with third parties. ExpressVPN may collect the time you connect to their service, the server location used and the total amount of data used per day. This is claimed to be to provide a better network experience and is analysed “generically”. ExpressVPN is registered in the British Virgin Islands and so any legal cases would be required to be brought there making their service “off-shore”. Live support is available 24 hours per day with an occasional small bit of downtime but in general they should be available to assist at almost any hour of the day. Their support agents appeared knowledgeable and were able to answer my queries in an efficient manner. Live support from many companies is often rather scripted and you often feel like you’re talking to a robot, however I had a little bit of fun with the support guys “Noel” and “Michael” and they took it in good spirit and diverted from the standard pre-defined responses. Support is also available via email which states will be answered within “a few hours”. I put this to the test on two occasions with the first response being received within 45 minutes and the second within 3 hours and 24 minutes which is rather good going considering it was late at night in the UK when I first opened a support ticket. A selection of general issues is available in a Troubleshooting guide which may answer the more common issues and remove the need for you to contact support in the first place. ExpressVPN is a large and friendly VPN provider. Prices for longer term accounts such as 6 or 12 months are comparable to the majority of other providers in the VPN industry with the single monthly account coming in a few dollars more expensive. If you’re considering ExpressVPN then a longer package length may be ideal due to the savings on offer. A full range of apps for major systems are available including Windows, Mac, Android, and iOS. Their custom software is uniform and easy to use for both the new user and the expert alike. For those who wish to set up the service themselves guides and configuration files are available. ExpressVPN offers PPTP, L2TP/IPSec and OpenVPN protocols plus SSTP that isn’t always available at every provider. For those after a wide range of server locations, they are certainly a provider who fits the bill. ExpressVPN offers connection points in over 78 countries that cover nearly every continent. Those that travel extensively on business or pleasure will be sure to find a server either in a location or a location close by. It also opens the service up to users in countries that are not ordinarily considered standard locations for the VPN industry meaning users around the world can protect their online privacy. Speeds were generally suitable for everyday web browsing, usage and streaming. It would be possible to stream 4k video from the likes of Netflix and it was certainly possible to use services such as BBC iPlayer, Sky Go, and Hulu. Speeds generally overall were rather low compared to some providers but as fast as others. For those who make heavy use of downloading or want to achieve top speeds then the service is unlikely to be suitable for your needs. Encryption available is generally at the lower end of the scale and although some providers do compare it is an area I would like to see improved on in the coming months to compete with other VPN providers out there. The support from ExpressVPN is excellent, they are extremely knowledgeable and helpful and resolved my queries in a super fast manner. Live support and email support is available around the clock with a troubleshooting guide available for the more everyday questions. Overall ExpressVPN provides a good service which would be suitable for the everyday user who wishes to protect their privacy on public Wi-Fi networks or stream content that is restricted to certain locations. I’d like to see ExpressVPN improve their speed and encryption in the coming months to bring it up to a higher standard. Best thing is to get this and Netflix, then you can go on one of those sites that let you search any movie and it’ll tell you which country has which movie. So worth it. That’s a great suggestion Victor, thanks for taking the time to suggest it. Having access to a greater catalogue of Netflix really makes Netflix and Chilling more interesting for sure! Thanks for the feedback Willson, appreciate you taking the time to post. Fast enough for me. No lag on youtube videos. Great news, thanks for sharing. i recommend expressvpn to anyone travelling to china! Express unblocks everything in China on Windows 10 and Android.